First impressions of arriving at Tiwai put any fears to rest that the recent vandalism either destroyed or tarnished the character of the property so as to make it impossible to DX. Caretaker and Life Member Paul Aronsen with several members of the Southland team have made a magnificent job or repairing the French doors, broken windows, and where necessary the aerials. The vandalism was not extensive in the house with the kitchen contents and accommodation largely untouched. The thieves were interested in the aerial fitting and the coaxial cable and did manage to steal the gas cooker and axe. Arthur de Maine arrived from North Otago a day or so earlier and was able to help Paul Aronsen in the last minute arrangements. Frank Glen and Peter Grenfell shipped in at late coffee time after a full days drive from Oamaru on the Friday evening and quickly settled into the homely surroundings and everyone was with headphones on by 2000hrs. Arthur was charged with keeping the joint log and this is reported elsewhere, but prior to listening there has been an established custom for some years now that when Peter Grenfell is in residence at Tiwai the traditional Naval ceremony of raising the flag is conducted. He acts as officer of the watch, chief petty officer, Master at Arms, Chief Gunner, (when necessary) scribe, whistle blower and if necessary he will take the roll of the Captain. Frank Glen has simply to follow his specific instructions under the keen eye of what ever role Peter is playing at the time and the flag is raised with the appropriate aplomb. 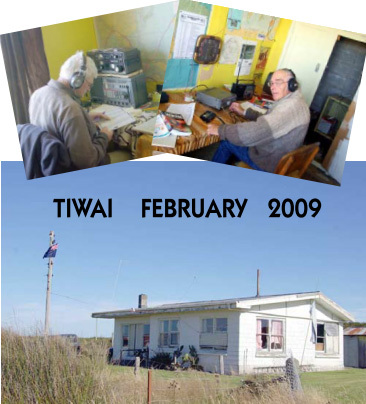 On this occasion a flag had been anonymously donated to Tiwai in the hope that it might flutter over the two other DX listening bases in New Zealand but improvident winds proved beyond the capacity of this particular NZ flag not to show evident signs of wear. Alternatives will have to be considered by a no doubt shortly to be appointed ‘Tiwai flag committee’. A feature undertaken during a visit to Tiwai is the statutory walk to the beach, and this presents a challenge to Peter who has the use of Canadian crutches. The mile track was dry and the beach ruggard, stormy and magnificent as ever with wonderful views of the Stewart, Ruapuki and Dog Islands. Later in the day Aronsen, Glen and Grenfell visited Omaui that had once been the site of a League Convention but which has since developed into an attractive beach resort. They travelled to Bluff and at Lands End just managed to get into the pub before they closed the dinner table owing to the large numbers present. The trio returned in time to hear good loggings of the 49 metre band and talk to Ray Crawford from Kingaroy on 40 metres. Sunday saw Grenfell and Glen off to Church as the newly appointed lady minister had only been ordained in November and was now at Frank’s home Church. It will be recalled that Glen slept through the sermon some years ago when members attending an dxpedition decided to go to First Church before hitting the Irish Pub in Dee Street for the mid day lunch. Peter saw to it that he did not repeat the performance. Paul & Mrs Aronsen with the lucky trio then went off to the Dee Street Irish pub for lunch followed by a trip down memory lane to Riverton Rocks. A reverential pause at the location of the hallowed icon ‘the 6X3’ followed by a personally narrated Tour by Paul Aronsen as he pointed out the cribs (weekenders) once owned by the Dxers of Southland. All of which goes to show that as canny Southlanders they knew a good thing long ago and have reaped well in the recent high sale prices. Sunday Night DX did not find everyone with pencil or twiddling. Frank Glen said he was exhausted and he went to bed, and by 2300 all of the lights were out. The social activities had without doubt taken the toll. Monday was pack up morning and we all undependably made our way back to our homes wondering if Tiwai will be there again for us next year. We will just have to play this by ear. The general impression was that reception was not up to the usual high standard, for example on the Sunday when Ray Crawford was returning to Kingaroy from Brisbane his mobile signal into Tiwai was only passable. Loggings were made, and pirates were heard as were some low powered North American’s and these can be read elsewhere in the Digest. The experience of going to Tiwai, living at Tiwai and DXing at Tiwai is a unique one that is right in the midst of the untouched thousands of hectares among the wilds of nature unsurpassed anywhere else in the world.